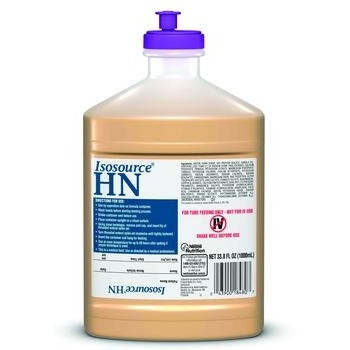 Isosource® HN is a high-nitrogen, high-protein complete liquid formula for standard nutritional support. 100% of the RDI, with the exception of chloride, in 1400 calories / 1165 ml. Isosource® HN is a high-nitrogen, high-protein complete liquid formula for standard nutritional support. 100% of the RDI, with the exception of chloride, in 1400 calories / 1165 ml. Lactose-free; Gluten-free; Low-residue; Kosher. Not for patients with galactosemia. For use under the care of a medical professional.